The current Brownwood Public Library building was completed in 1966 and ushered in a new era of services to the citizens of Brownwood and Brown County. The original city library building (pictured to the left), constructed in 1904, was one of 2,509 funded by Andrew Carnegie in the U.S. and other English-speaking countries. Brownwood’s pillared, two-story library building was financed by Carnegie at a cost of $15,000. In turn, the city government agreed to provide an annual budget for materials (books, etc.) and maintenance. For 61 years, this Carnegie building served the community—providing materials of both educational and recreational value; as a club and activity center; as a stage for live entertainment; and, during World War II, providing space for the Red Cross to make surgical dressings for military personnel. As the decades passed, and Brownwood grew and provided more accoutrements customary in a smaller town, the library focused its energies on providing reading materials to the public. For a number of reasons, the Carnegie building proved inadequate to meet even this limited need. Of significant note, as book stacks are very heavy, structural problems rendered the second floor only useful for storage. Consequently, the old building was torn down in 1965 after arrangements had been made to provide a new building. A city bond issue for $95,000 was passed on September 24, 1963, to construct a new building. This bond issue, along with funding provided under the auspices of the Texas State Library and the federal Library Services and Construction Act of 1964, provided the $175,000 necessary to defray construction costs. Construction began with a groundbreaking ceremony performed on November 4, 1965. Materials were moved into the new building in August, 1966. The Brownwood Public Library Association is chartered by the State of Texas as a nonprofit corporation, but receives the bulk of its funding from the Cities of Brownwood, Early, and the County of Brown. It is governed by an 11-member board of trustees who are appointed to three-year terms by the Brownwood City Council. The library is directed by a librarian with a Master's Degree in Library Science. The library has an extensive collection of materials. At the present time, it holds approximately 59,000 books. These books include easy readers for young children learning to read; juvenile fiction and nonfiction; young adult fiction ; and adult materials subdivided into the following categories: Texana, Nonfiction, General Fiction, story collection (short stories), Westerns, Science Fiction, Mysteries, Graphic Novels and Large Print books for the blind and visually impaired. We also carry a wide array of DVDs and books on CD. The library also offers books and audiobooks that can be downloaded to Kindles, iPads, Nooks and other digital devices. Just like a physical book, these can be checked out and are automatically returned at the end of the lending cycle (no late fees!). 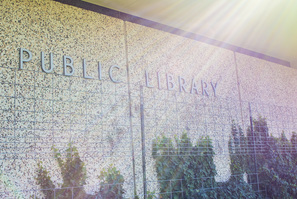 The library offers more than 25 public-access computers that can be used for Internet browsing, word processing, spreadsheets and other computer needs. As the only place in our community for public-access computers, these are an invaluable resource for those who do not have computers at home but need to work on school projects, apply for jobs, or keep in touch with family. We also carry newspapers and magazines in both paper and online formats. Through the TexShare Databases, patrons can access searchable current and back issues of more than 400 newspapers and hundreds of popular and scholarly magazines. Other password-protected databases available online include language courses (for more than 80 languages), test preparation classes and practice tests (for everything from elementary school to SAT to job-specific exams), citizenship courses, computer skills classes (for everything from mouse skills, to beginning and advanced Microsoft training, to Adobe Photoshop), legal forms, and much, much more. Contact the library for a password and log-in for these resources. In addition, the library has two rooms available. The Carnegie Room seats 30 people and includes a projection screen, computer and podium. It is for library programs and is also available are available for use by non-profits and community groups. The Study Room is available for all patrons. It comfortably seats eight. Patrons may hook their laptop to the projection screen and use the dry erase screen. The library also has a Local History & Genealogy Annex that was opened at 213 S. Broadway in 2006. This move, in conjunction with closer cooperation with the Pecan Valley Genealogy Society, has meant improved service in these areas of research. Additionally, the library also has programs for children that include Story Time and a Summer Reading program. Storytime is held at 10:00 on Thursday for toddlers 18-36 months and at 11:00 on Thursdays for preschoolers age 3-5 years old. For situations where the information/education needs of the public cannot be met in-house, we participate in an Interlibrary Loan (ILL) program with the state of Texas. If we don’t have what you’re looking for we can probably get it. The Brownwood Public Library has a long and illustrious history of serving the residents of Brown County. We continue to strive for ways to improve and serve you better.